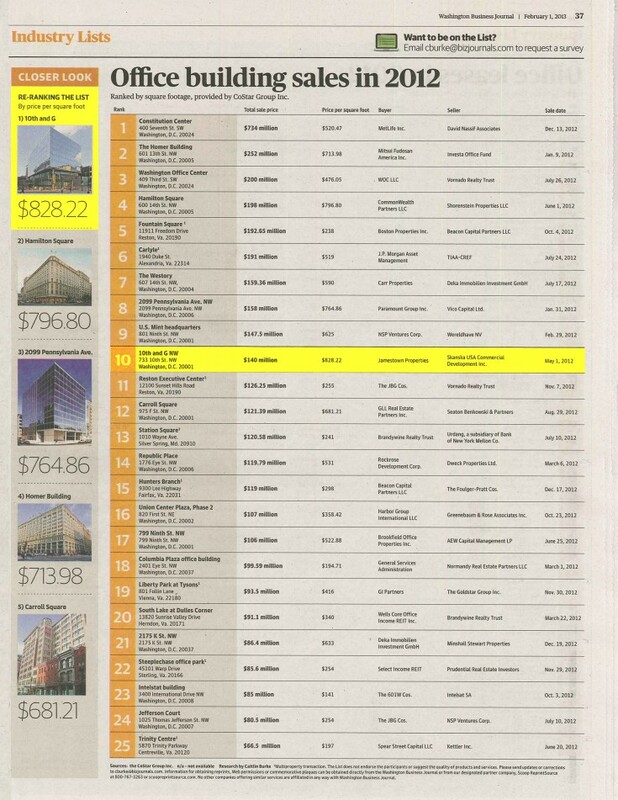 The Washington Business Journal has announced that 10th & G Street Offices by Cunningham | Quill Architects, achieved First Place (in price per square foot) of all office building sales in the DC Metro area in 2012. The 188,000 square feet of Class A office space is part of a larger mixed-use project that includes Church worship space for 300 congregants and a ground floor retail program. Responding to the solicitation from the First Congregational United Church of Christ, the design for this project represents a bold new architecture for this challenging program. This takes advantage of its location by instilling lively activity into the area and incorporating new uses in the Penn Quarter and Gallery Place neighborhoods of Washington, DC. The project has been recognized with an Award from the American Institute of Architects and has achieved LEED Gold Certification. The project is immediately adjacent to the Martin Luther King Public Library (Mies Van Der Rohe’s only building in Washington DC) and across the street from CQA’s award-winning Mather Building Studio Lofts. We are pleased to partner with Skanska USA, PN Hoffman, and Todd Williams and Billie Tsien Architects on this project.